The VAPINAL inhalation device has a stainless steel heater with a resistance of 230V. It delivers hot, humid steam combined with the outer bottle's natural spa water and its active principals. Outer bottle is not included with the unit. Keep track of every dose Bluetooth enabled medication inhaler sensors designed for both control and rescue medications fit most MDI and Diskus inhalers, and automatically track medication use. 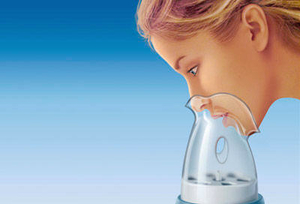 An inhaler is used to breathe in therapeutic substances. In general, inhalation therapy employs water vapor to humidify the respiratory system when it has become too dry due to colds or other conditions. Sometimes the inhaled product is warmed, since heat also possesses significant therapeutic effects. Essential oils, plant-based infusions or other products may be added to augment the efficacy of the treatment. These devices include warm air, vapor and hot spring water models. Some electronic models designed for asthma treatment are equipped for wireless network communication, enabling a physician to monitor the patient's medication intake remotely.